Anime Japan is being held March 21 to 22 at Tokyo Big Sight, a convention center that anime fans are likely familiar with, even if they've never set foot in Tokyo. Home to trade shows like Anime Japan and conventions like the bi-annual Comiket, it's made appearances in dozens of anime. 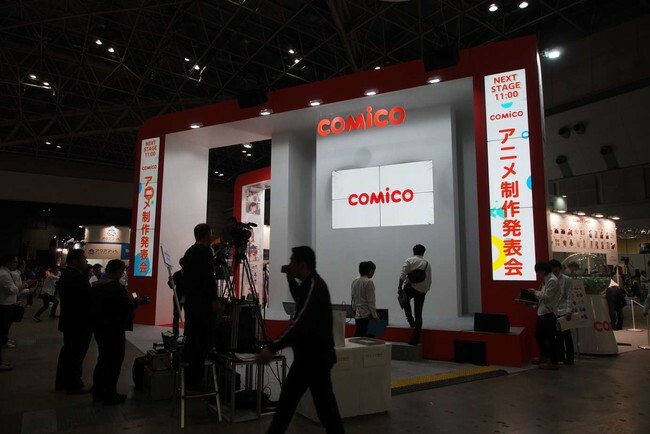 This year, like last year, Anime Japan took up two entire halls at Tokyo Big Sight, with many of the largest licensors showing off their newest and latest. Fans also had the chance to purchase limited edition event goods, assuming they lined up early enough—even just a few minutes after the doors opened, several of the booths already have lines numbering in the upper double-digits. By the early afternoon, many booths had already sold out of some of their hottest items. One big thing I noticed is that many of the booths are really into replicating animators' desks, as well as the workspaces of other production staff workers. This year, Anime Japan even hosted a "production works street" that guides visitors through the animation production process. Whether or not this is directly related to the popularity of Shirobako is hard to tell, but it was all pretty cool to see. I started at the East Hall, which had booths like Aniplex, Dentsu, Kadokawa, Bushiroad, and more. TV network AT-X, which had standees and posters of upcoming and previously aired properties. Special features included cast-autographed jerseys from Ace of Diamond and an autographed standee from Hello! Kin-iro Mosaic, the second second of Kinmoza. AT-X's Anime O-EN Project, a group of six self-proclaimed otaku girls whose mission is to spread anime around the world. An ad for Uchū Senkan Yamato 2199: Hoshi-Meguru Hakobune (Star Blazers 2199) by pachinko company Sankyo, one of the sponsors of Anime Japan and owner of Satelight Inc.
Pony Canyon's booth, with emphasis on the TV anime adaptation of the Rokka no Yūsha light novel, Lance N' Masques, Kyoto Animation's Hibike! Euphonium (Sound! Euphonium), and BONES' adaption of Sanrio's mobile game Show By Rock. A Lawson employee selling [email protected] tea! Japan Anima(tor)'s Exhibition, with a replica of an animator's desk from Studio Khara. Visitors to the booth also received Studio Khara blank animation materials, such as timing sheets, storyboard sheets, and more. Those who downloaded an app received a Studio Khara x Dwango flip book. GodHand Tools' mascot, Nipa-ko. The company specializes in precision instruments, including full-flush nippers for model building. More Kadokawa. Titles on display included Yokai Watch, KanColle, The Disappearance of Nagato Yuki-chan, and more, as well as products for properties licensed or distributed by Kadokawa. Broadcasting station BS11, showcasing some of the title fans can hope to see this upcoming season. In a way, Fatheads, except anime, from Pierrot. Plus, current and upcoming properties, including the anime adaptation of Hinako Seta's four-panel horror comedy manga Re-Kan!, Naruto, Baby Steps, Yona of the Dawn, and Tokyo Ghoul. Studio Puyukai's Akukaru: Play with Ibaraki, which tells the story of the agricultural culture in Ibaraki Prefecture. Unsurprisingly, the studio is also based in Ibaraki. An app from Mezamashi Manager that lets you interact with Sword Art Online's Asuna, who will also act as an alarm clock and wake you up in the morning. The Aniplex booth. Every year, the company's booth has a theme. This year, it was sakura saku, or cherry blossoms. Each of the character stands has original, sakura-themed artwork. Those who wanted to take the artwork home with them could buy special long posters. To enhance the experience, the booth even had a machine that rained sakura petals down on those passing through the gates, for their own faux hanami. Inside, the booth had separate vignettes for all their ongoing and upcoming properties. Yes, I checked for you. The [email protected] Cinderella Girls. Visitors could scan a plaque to receive an AR character. The Gintama vignette. It's a take on TV Tokyo program Why did you come to Japan? Free! Eternal Summer debit cards, with Mitsubishi Tokyo UFJ-Visa. Sugoi Japan, a nationwide poll for Japan's pop-culture works. The grand prize was Madoka Magica. Click here to head over to West Hall for hundreds more photos!